I’ve been focusing on this fracking and high-yield debt bubble precisely because it’s most likely to become the new trigger that the housing and subprime bubble was to the last global financial crisis in 2008/2009. Bubbles just go on and on until they either get so extremely high that they burst of their own weight — as with the tech bubble — or more often when something triggers defaults that then cascade through the very debt markets that helped create the bubble. We have even greater U.S. and global debt levels than in 2008, with unprecedented stimulus and money printing, as if you could cure excessive debt with more debt. The last crisis was triggered by a subprime crisis that focused in just four states: California, Florida, Arizona and Nevada. The high foreclosure rates are still in these states (along with Detroit and narrow parts of the Midwest that have seen massive job losses and demographic implosion). Extreme fundamental trends are rapidly affecting demographic spending, the highest public and private debt ratios in the developed countries and the emerging market debt bubble… these are all coming together to bring on the next global debt crisis that will only be greater. Falling commodity prices, especially oil, will continue to trigger more debt crises, like falling home prices did in the last one. The commodity plunge is already killing countries like Venezuela, Russia, Iran and Iraq. The first to go will be the U.S. frackers increasingly defaulting on high-yield or junk bond debt. The second will be emerging country companies defaulting on U.S. high-yield bonds and bank loans. Then the house of cards will fall as it did in 2008 when high-yield or junk bond rates spiked from 7.5% to 23.5%. Such yields have already spiked from 5% to 7% and higher risk energy bonds from 5.5% to 10%. This time around the junk bond yields overall could spike from 5% to 25% or more! Just as falling home prices, which no one expected, triggered the subprime crisis; falling oil prices will trigger the fracking and high-yield debt bubble. The high-yield bond market already sank 10% recently with energy-based bonds falling 20%. And of course, the raging stock markets are largely ignoring this crystal clear peril. The chart below shows how dominant horizontal drilling (fracking) in red has become in recent years in the U.S. Note that fracking started to accelerate in 2003, and like traditional vertical oil wells, took a dive in 2008/early 2009 as oil crashed from $147 to $32. 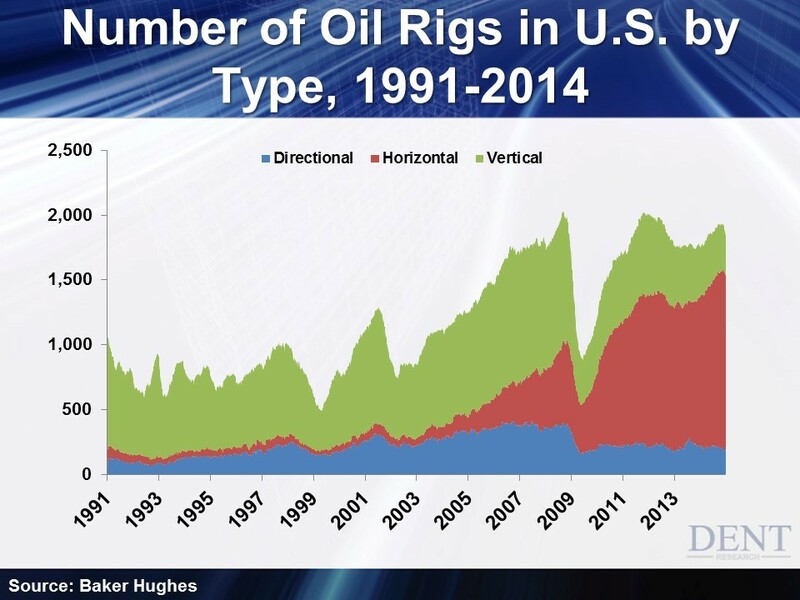 All types of rigs boomed simply due to rapidly rising oil prices into late 2007 as you would expect. But vertical wells still dominated at about 75% at the top of the last boom in late 2007. Now it has flopped to the opposite, near 75% from horizontal and fracking. How did that happen? What changed after 2007 was the quantitative easing (QE) money printing that drove junk bond yields to unprecedented low rates of 5% and this was a huge advantage for fracking. Horizontal wells have high upfront discovery costs and then low pumping costs — but unlike traditional wells, they only last two years on average. So, you have to keep borrowing and drilling. This approach depends even more on financing and such cheap borrowing rates made it more profitable and competitive, along with the next rally in oil back to $115. The QE bubble created the fracking bubble and now it’s nearly 75% of oil production and concentrated in two states, Texas and North Dakota. Now with oil prices plunging again, the entire fracking industry is not competitive unless oil prices get back toward $100 and that ain’t going to happen — mark my words! Many drillers will not be able to pay back these high-yield bonds and leveraged loans — just like the subprime mortgage borrowers with no down payments when home prices collapsed. So what am I watching over the coming months? Not Fed policy, I’ll be keeping a close eye on oil prices! One way or the other, the next oil crash is very likely to trigger the next debt crisis and the stock crash. We have more than a few months to go before our 2015 Irrational Economic Summit (IES). And we’ll be tackling quite a few subjects in our newsletters in that time. But there’s one thing that will be changing in the weeks to come and that is availability to join us in Vancouver this year. Read up on what we presented in 2014… and make sure to reserve your seating for this year. We look forward to seeing you.